Whether it was because I was looking at the right places, or just that this year was really special and we were able to enjoy a wide range of great quality fruit, I am not sure. All I know is that I have been making jams and compotes like crazy, and was attempting to dry and preserve the fruit like never before.Preserving fruit became new baking for a while.. The original idea was to make a few posts about it, but due to two lazy weeks in Spain, I'll share my newly discovered expertise in a couple of posts. 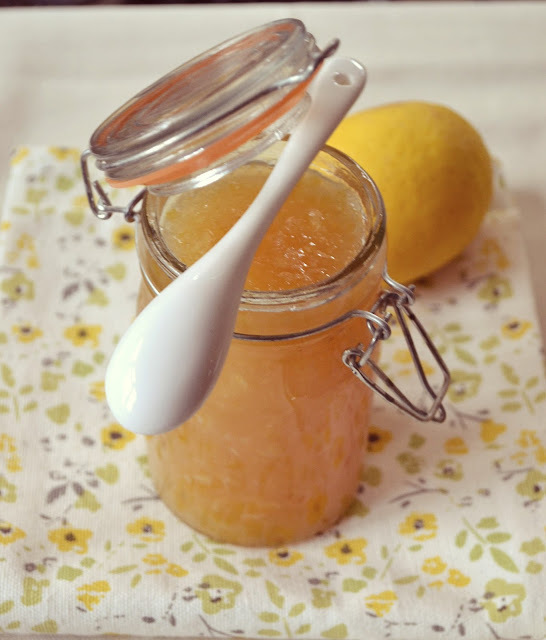 - if you prefer to have pieces of fruit in your jam, bear in mind that sugar has a hardening effect and that soft-skinned fruit (berries for instance) should be soaked in sugar before cooking, tough-skinned fruit however should be treated quite the opposite way and have to be simmered before adding the sugar. - if you prefer your jam smooth, as I do, run it through a food-processor, or some sort of mesh. - the next important thing is that the sugar has to be completely dissolved before the jam reaches boiling point, otherwise it will be difficult to set. Test it by dipping a wooden spoon in. If crystals are not visible on the back, the sugar has dissolved. Cook the fruit and cinnamon stick for 20 minutes, lower the temperature and add the sugar and continue cooking for another 15 minutes, stirring occasionally. Take it off the heat, let it cool and blend in a food-processor if you prefer it smooth. Pour it back and let it cook for another 5 to 10 minutes, add vanilla at the end, then follow the above written procedure to store it. This preserve you can make over a period of few months. Open a jar and keep adding ingredients, put small fruit like berries, whole, cut the large ones into the small pieces. You will end up with a sweet fruity drink and rum soaked fruit that can be used in desserts and cakes. Wash the lemons and remove the top button to which the stalk was attached. Cut the lemons in half. Squeeze the lemon juice and preserve all the pulp that has not passed through the strainer. Remove all the seeds. Remove the white membrane from the lemon core. Place the lemon cores in a large saucepan and cook in boiling water for 60 minutes, changing the water in between at least 3 times. Place the cooked and strained cores in a food processor and blend to a coarse mixture. Add in a couple of tablespoon of lemon juice if it is hard to blend. Place the coarse lemon peel, lemon juice and pulp and sugar in a large saucepan. Bring to a boil and cook for about 10 minutes. To sterilize the jars place them (without the lid) in an oven for 30 minutes at 150 C. Place the lids in boiling water for 5 minutes. Remove the jars from the oven and while still hot pour in the hot jam. Close with a lid. I wish I had enough rosehips (and knowledge if I am honest) in my garden to make jam, as it has been my favourite since my childhood. I only had a few handfuls and all I could do is to dry them out for tea. They should be picked in the morning, cleaned and left on a tray to soften a bit for a day or so. Cut them open, and take the seeds and wooden parts out, wash, pat them dry and leave for another few days to dry properly. You can grind them before storing them in a clean, air tight container. 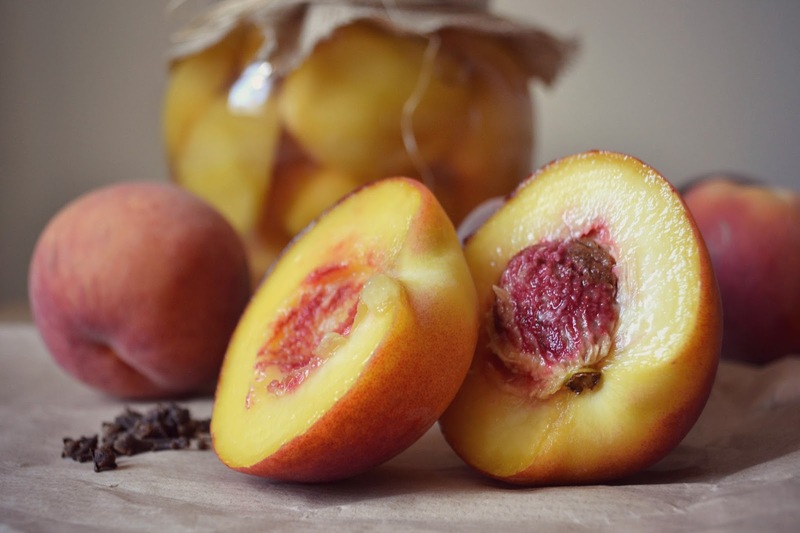 Peel the peaches, cut them into small slices, wash the berries, pat them dry. Bring the sugar, lemon juice and water (enough to soak the sugar) to boil, lower the temperature and add the fruit. Cook for 20 minutes, blend, return to heat for another five minutes, store in sterilized jars. 1 kg of juicy but firm peaches, peel and half them, take the stones out and lay them tightly in a large sterilized jar. Make a syrup: boil 500 ml of water with 250 g of sugar for a few minutes, pour while hot over the peaches and put the lid on. Place into a large pan with boiling water and pasteurize for 40 minutes. Do not take it out until completely cold.